Indigenous peoples of the Northeastern Woodlands include Native American tribes and First Nation bands residing in or originating from a cultural area encompassing the northeastern and Midwest United States and southeastern Canada. It is part of a broader grouping known as the Eastern Woodlands. The Northeastern Woodlands is divided into three major areas: the Coastal, Saint Lawrence Lowlands, and Great Lakes-Riverine zones. The Coastal area includes the Atlantic Provinces in Canada, the Atlantic seaboard of the United States, south until North Carolina. The Saint Lawrence Lowlands area includes parts of Southern Ontario, upstate New York, much of the Saint Lawrence River area, and Susquehanna Valley. The Great Lakes-Riverine area includes the remaining inland areas of the northeast, home to Central Algonquian and Siouan speakers. The Great Lakes region are sometimes considered a distinct cultural region, due to the large concentration of tribes in the area. The Northeastern Woodlands region is bound by the Subarctic to the north, the Great Plains to the west, and the Southeastern Woodlands to the south. Map of North East United States showing demarcation between Iroquoian (purple) and Algonquian (pink) Indian tribes. 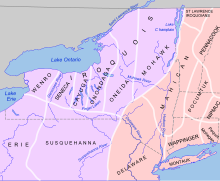 By around 1100, the distinct Iroquoian-speaking and Algonquian-speaking cultures had developed in what would become New York State and New England. Prominent Algonquian tribes included the Abenakis, Mi'kmaq, Penobscot, Pequots, Mohegans, Narragansetts, Pocumtucks, and Wampanoag. The Mi'kmaq, Maliseet, Passamaquoddy, Abenaki, and Penobscot tribes formed the Wabanaki Confederacy in the seventeenth century. The Confederacy covered roughly most of present-day Maine in the United States, and New Brunswick, mainland Nova Scotia, Cape Breton Island, Prince Edward Island and some of Quebec south of the St. Lawrence River in Canada. The Western Abenaki live on lands in New Hampshire, Vermont, and Massachusetts of the United States. The five nations of the Iroquois League developed a powerful confederacy about the 15th century that controlled territory throughout present-day New York, into Pennsylvania and around the Great Lakes. The Iroquois confederacy or Haudenosaunee became the most powerful political grouping in the Northeastern woodlands, and still exists today. The confederacy consists of the Mohawk, Cayuga, Oneida, Onondaga, Seneca and Tuscarora tribes. The area that is now the states of New Jersey and Delaware was inhabited by the Lenni-Lenape or Delaware, who were also an Algonquian people. 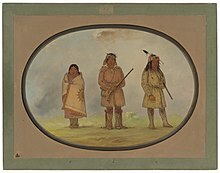 Most Lenape were pushed out of their homeland in the 18th century by expanding European colonies, and now the majority of them live in Oklahoma. The characteristics of the Northeastern woodlands cultural area include the use of wigwams and longhouses for shelter and of wampum as a means of exchange. Wampum consisted of small beads made from quahog shells. The most important social group was the clan, which was often named after an animal such as turtle, bear, wolf or hawk. The totem animal concerned was considered sacred and had a special relationship with the members of the clan. The spiritual beliefs of the Algonquians center around the concept of Manitou (/ˈmænɪtuː/), which is the spiritual and fundamental life force that is omnipresent. Manitou also manifest itself as the Great Spirit or Gitche Manitou, who is the creator and giver of all life. The Iroquois equivalent of Manitou is orenda. ^ Mir Tamim Ansary (2001). Eastern Woodlands Indians. Capstone Classroom. p. 4. ISBN 9781588104519. ^ "History of Pre-colonial North America." Essential Humanities. Retrieved 13 July 2013. ^ a b c d e f g h i j k l m n o p q r s "Cultural Thesaurus". National Museum of the American Indian. Accessed 8 April 2014. ^ "Hopewell Culture". Ohio History Central. Retrieved 14 March 2019. ^ Bain, Angela Goebel; Manring, Lynne; and Mathews, Barbara. Native Peoples in New England. Retrieved July 21, 2010, from Pocumtuck Valley Memorial Association. ^ "Native People of New Jersey". ALHN New Jersey. Retrieved 14 March 2019. ^ Northeast American Indian Facts Native American Indian Facts Retrieved 7 March 2019. ^ "Canoe". Encyclopedia Brittanica. Retrieved 26 March 2019. ^ Bragdon, Kathleen J. (2001). The Columbia Guide to American Indians of the Northeast. New York: Columbia University Press. p. 18. Trigger, Bruce C. "Introduction." William C. Sturtevant, general ed. Handbook of North American Indians. Washington, DC: Smithsonian Institution, 1978. Trigger, Bruce, volume ed. Sturtevant, William C., general ed. Handbook of North American Indians. Washington, DC: Smithsonian Institution, 1978.